This Dead Men Tell No Tales review was made after playing the game four times. What is Dead Men Tell No Tales? Dead Men Tell No Tales takes you to the high seas where you must survive on a burning pirate ship long enough to collect a certain amount of treasure. Each game has fires and undead pirates to deal with along the way, though, so it’s no easy task! Dead Men Tell No Tales was created by Kane Klenko and is published by Minion Games. At the start of each game of Dead Men Tell No Tales, a T-shaped, four-space board is put down to represent the ship that the pirates are attempting to loot. Each room on the ship has a different fire level that players need to deal with in order to move around. Each player starts their turn by revealing a new room, which must be placed somewhere on the ship where there can be a connecting doorway. 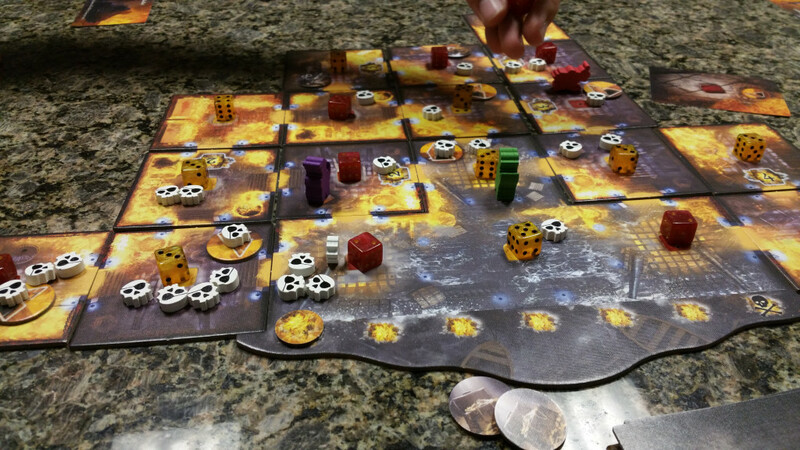 The space gets a fire die and a skeleton/loot token. The number that shows up on each die is that room’s fire level; the higher the fire level, the worse the fire is in that room. The pirate players use five action points (and any special abilities) to move around the ship to fight fires, swap items, fight the skeletons and more. If a player chooses not to use all of his or her action points, they are transferred to the next player. If you are able to get the amount of loot you set out to get at the beginning of the game, everyone wins! There are a number of ways you can lose, including if the ship blows up, if too much loot is lost, and if you get stuck on the ship. Obviously that is a very brief overview on how to play the game. Check out the official Dead Men Tell No Tales rulebook (PDF) for more details. Dead Men Tell No Tales definitely has a unique theme as it is one of the only pirate games that is also cooperative. The chaos on the ship with the fires spreading and the skeletons coming to get you really does work. The game has a cool look to it. The artwork on the cards looks great and really pops, especially the pirate artwork. I also really like the look of those skeleton tokens. I also really like the stamina meter that tracks each player’s health points. It forces you to strategize how to take care of obstacles on the ship while keeping yourself healthy enough to handle future actions. Being able to pass some actions to the next player is a nice co-op mechanic. You can figure out as a team who needs the actions the most based on who needs help and who can get a lot of loot right now. Players who enjoy the mechanics and theme of Dead Men Tell No Tales will also like that it is virtually impossible to play the same game twice. The randomness of the ship tiles and the loot tokens make it a different challenge every time you sit down to play it. Dead Man Tell No Tales isn’t a complex game, but it is extremely difficult to beat. Normally my group sees this as a good thing, but some of the ways that you can lose are very frustrating. It often feels like you have to play a perfect game to win, but even then you might lose. While we did have a pretty good time playing Dead Men Tell No Tales, it was noticeable right away that this game felt very similar to other co-op board games we’ve played. One game that immediately came to mind was Flash Point: Fire Rescue, which has similar fire-spreading and fire-fighting mechanics but, in my groups opinion, is a better all-around experience. Unfortunately my group was a bit underwhelmed by our experiences with Dead Men Tell No Tales. Some of the mechanics are solid and the artwork is fantastic, but it simply didn’t wow us enough to stay in our game rotation. Some of that had to do with the randomness, but it mostly came down not being very satisfied with the experience once the game was over. It has the feel of games like Flash Point and Pandemic, but just about everyone in my group would rather play those games if we had to choose. Just because it wasn’t a hit for my group doesn’t mean that your group won’t enjoy it. if you are interested in pirate board games and want a very tough challenge, you might get a kick out of Dead Men Tell No Tales. Thanks for taking the time to read our Dead Men Tell No Tales review!